Fireman Sam: Race to the Rescue! Push Pull and Slide! Join "Fireman Sam" and his friends in this exciting "Bumper Activity Book". 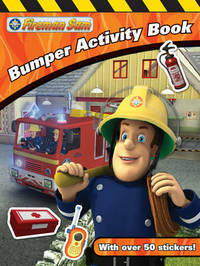 From mazes and counting to colouring and dot-to-dots, this book is packed full of "Fireman Sam" activities and puzzles. Together with over 50 colourful stickers of everyone's favourite friends from Pontypandy, this is the perfect activity book for keeping all "Fireman Sam" fans busy.